Why it’s daunting: While the medium evolved out of tossed-off children’s stories, superhero comics have grown into one of the most sprawling, complex, intimidating storytelling media imaginable. Even in a serious downturn for the industry, there are dozens of publishers putting out hundreds of titles every month. The big two companies, Marvel and DC, have over a hundred years of cumulative history between them, and an impossibly convoluted fictional universe that even the most devoted fans have a hard time making sense of. And speaking of those fans, they tend to be a contentious, opinionated lot, not especially welcoming to newcomers. Possible gateway: DC’s 12-issue All-Star Superman miniseries, written by Grant Morrison and drawn by Frank Quitely. Why: DC’s All-Star series was meant to be a showcase for the company’s big-name creators to take their favorite character out for a spin without getting snared in the ugly net of continuity that comics fans have been arguing about for the last 40 years. Grant Morrison, one of the most creative storytellers in the industry, took it as an opportunity to strip down no less an iconic figure than Superman to his most basic, appealing elements. Morrison didn’t entirely jettison the myriad aspects of the Last Son Of Krypton; instead, he deftly blended them into some of the most entertaining superhero stories that mainstream comics have seen in decades. Any one of his portrayals of Superman’s supporting cast, from the arrogant Lex Luthor to the headstrong Lois Lane to the irrepressible Jimmy Olsen, could stand as the definitive one, and his Superman, perfectly integrated with his human side and heavy on the science-fiction elements that made his Silver Age stories so appealing, is pitch-perfect. 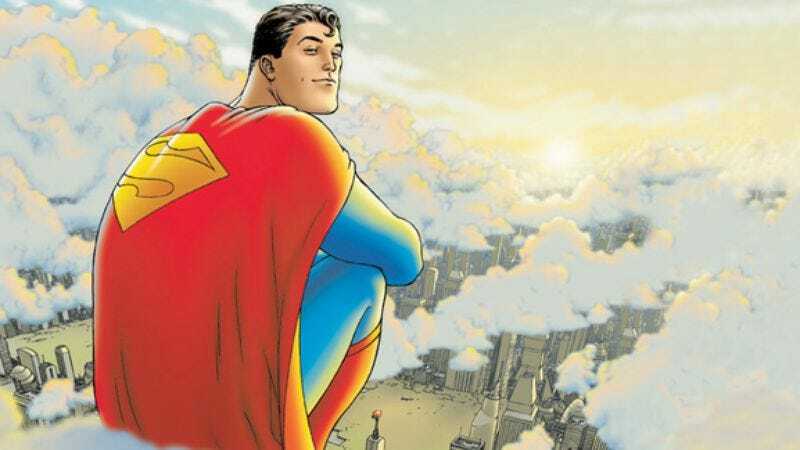 Superman is often tarred as the boring, predictable Boy Scout of cape-and-cowl stories, but with Morrison at the helm, he radiates the moral authority and confidence that made him the biggest superhero of all time. Fellow Scot Frank Quitely has never been better than he is here; it’s a nice fusion of the tremendous sense of movement and dynamics of previous generations and the color and energy of modern comics. The cover of the first issue is already a modern classic, and it only gets better from there. Though it was a long time coming (its 12 issues took three years, from 2005 to 2008, to complete), it’s clear that taking their time paid off for Morrison and Quitely; the result is a comic entirely suitable for modern sensibilities, friendly to those indulging for the first time, and suffused with respect and admiration for what came before. Next steps: Frank Miller and David Mazzucchelli’s ’s Batman: Year One; Marvel Masterworks collections of Stan Lee & Jack Kirby’s Fantastic Four and Stan Lee & Steve Ditko’s Spider-Man; Mike Baron & Steve Rude’s Nexus. Where not to start: Alan Moore and Dave Gibbons’ Watchmen, or Frank Miller’s Batman: The Dark Knight Returns. Both are tremendous books—among the greatest superhero stories ever created—but they both benefit a great deal from a prior grounding in the conventions of the genre; Moore and Miller were able to shatter the rules so effectively because they knew them so well.